a) Calculation of radar astronomy frequency channels using a polyphase filter bank. b) Obtaining the Bit Error Rate (BER) from a Viterbi decoder in a communications system. c) Pixel-streaming video processing algorithms on high-resolution video. Generating an HDL test bench to verify such a design is time consuming because the coder must simulate the model in Simulink to capture the test bench data. A faster generated test bench alternative is the HDL Verifier™ SystemVerilog DPI test bench. The SystemVerilog DPI test bench does not require a Simulink simulation, so for large data sets it generates a test bench in a shorter time than the HDL test bench. HDL Verifier™ SystemVerilog DPI test bench integrates with Simulink Coder™ to export a Simulink system as generated C code inside a SystemVerilog component with a Direct Programming Interface (DPI). 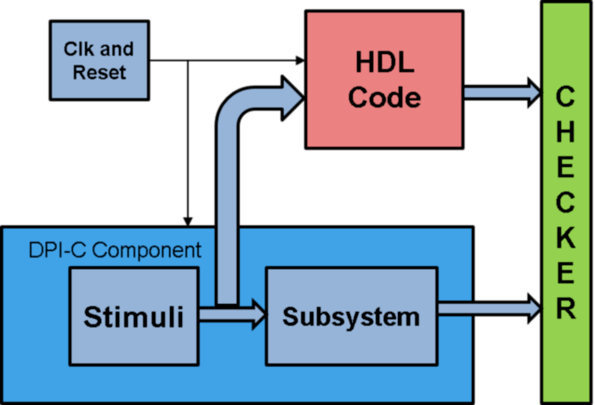 Within the DPI-C component the stimuli is generated and applied to the C subsystem and also applied to the generated HDL code for the Simulink system. The test bench compares the output of the HDL simulation with the output of the DPI-C component to verify the HDL design. Polyphase filter bank is a widely used technique to reduce inaccuracy in FFT due to leakage and scalloping losses. Polyphase filter bank produces a flatter response as compared to a normal DFT by suppressing out-of-band signals significantly. The model is a Polyphase Filter Bank which consists of a filter and an FFT that processes 16 samples at a time. See Polyphase Filter Bank HDL Example for more information about the Polyphase Filter Bank. The InitFcn callback(Model Properties > Callbacks > InitFcn) sets up the model. In this example, a 512-point FFT with a four tap filter for each band is used. The dsp.Channelizer object is used to generate the coefficients. The algorithm requires 512 filters (one filter for each band). For a vector input of 16 samples the filter implementation shares 16 filters, 32 times. The input data consists of two sine waves, 200KHz and 250 KHz. This will generate an HDL test bench by simulating the model in Simulink and then capturing the test bench data. This command generates a SystemVerilog test bench without running a Simulink simulation. Instead of a simulation, the code exports the Simulink system as generated C code inside a SystemVerilog component. The test bench verifies the output data by comparing it with the output of the HDL design. The makehdltb function also generates simulator-specific scripts for compilation and simulation. SystemVerilog DPI test bench can be used to verify HDL designs of both target languages - VHDL and Verilog. Alternatively, you can set SystemVerilog DPI test bench options on the 'HDL Code Generation > Test Bench' pane in Configuration Parameters. a.) PolyPhaseFilterBank_dpi_tb.sv - This is the SystemVerilog test bench that verifies the HDL code. b.) 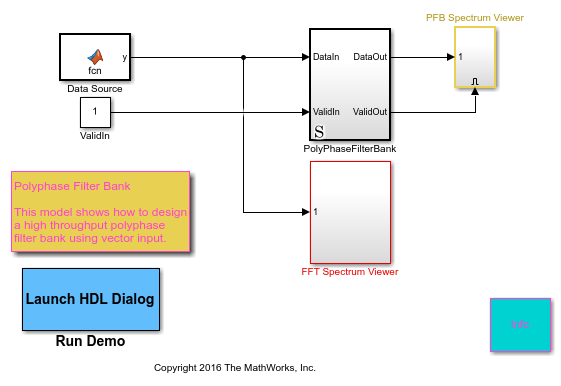 PolyPhaseFilterBank_dpi_tb.do - This is the macro file that Mentor Graphics ModelSim® uses to compile the HDL code and run the test bench simulation. Based on the selected simulator, the coder generates a different file for compilation and test bench simulation. For instance, if you select 'Incisive', the coder generates 'PolyPhaseFilterBank_dpi_tb.sh' for compilation and simulation on Cadence Incisive®. a.) On the 'HDL Code Generation > Test Bench' pane, select the check box labeled 'HDL code coverage'. The HDL code coverage artifacts are generated in the source directory after the test bench is simulated. The sampling frequency is 2e+6 Hz, which means that the simulation to generate the HDL testbench collects 2e+9 samples. For certain applications, it takes more samples to obtain the right frequency from the polyphase filter. An increase in required simTime would also increase the time required to generate an HDL test bench. A solution for such applications is to use the SystemVerilog DPI test bench. The generation time for the test bench remains the same no matter how many samples your test scenario requires. A log plot of generation time for both these test bench types with respect to the Number of samples, shows that while HDL test bench requires more generation time with an increase in the number of samples, generation time for the SystemVerilog DPI test bench remains constant irrespective of the number of samples. 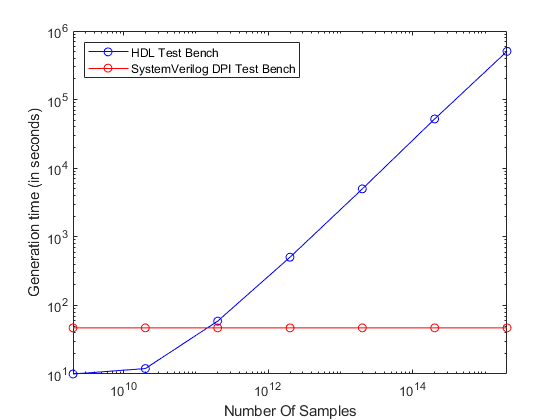 While HDL test bench is very efficient for a small number of samples, if your test scenario requires a large number of samples, HDL Verifier™ SystemVerilog DPI test bench provides faster test bench generation.